Moolchand then gets busy making a machaan (tree-house) where he will stay the night to guard the harvest against wild animals. He has harvested seven tonnes from his 1.2-hectare farm. Asking his son Kuber to look after the grain, Moolchand says, “Earlier, we were completely dependent on cattle rearing. But after a fodder constraint in the early 1990s, we took to farming. The old kuchcha pagaraa came to our aid. Even my grandfather had no idea when the stone structure was erected.” About 200 km east of Rajasthan’s capital Jaipur, once abounding in prickly acacia and terribly parched in summer, Moolchand’s village is a part of a region reinventing an old soil conservation system. The erstwhile grazier describes the kuchcha pagaraa as a low wall of stone plates that check the soil being swept away by the stream’s monsoon flow. Karan Singh, an activist with non-profit Gram Gaurav, explains the structure’s working. “The stream carries rainwater and soil from surrounding plateau and hills. The pagaraa makes this soil settle down and accumulate on bed-rocks,” he describes. People grow crops on this accumulated soil once the monsoon recedes. Singh’s organisation is among those credited with giving a new form to these traditional irrigation structures, making them more effective. “In 2001, I initiated construction of lakes and ponds in Sawaimadhopur district, adjoining Karauli. 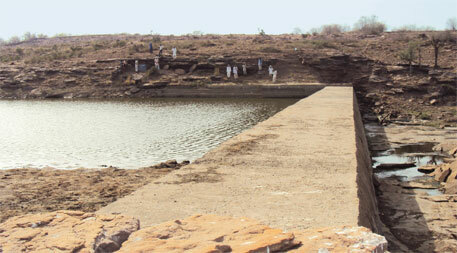 These areas were then reeling from water scarcity. Soon I was looking beyond textbook water harvesting methods,” he says. Pirbhulal, a resident, says people in the area had to travel nine kilometres so that their livestock could drink water. “We had planned a well to preserve drinking water. But it needed at least Rs 1 lakh,” says Phoolchand, 45, another resident. “The concern of Baraki and surrounding villages like Lakhnaki, Nureki, Khateki, Kularaki and Daulatiya to provide drinking water to cattle was met after the construction of the anicut in 2006,” says Kuldip Singh, secretary of Gram Gaurav. Some families in Khajura village in Karauli were practising farming by constructing kuchcha pagaraas to slow down soil erosion. This traditional system of farming and water harvesting had a big influence on Singh who was schooled in water conservation by constructing ponds and lakes. “The farmers did not use fertiliser but the water coming down to the stream was replete with organic manure,” he says. Soil was still getting eroded. Singh thought a cement structure would be more effective in checking erosion. “I was, however, an outsider. People in the region were understandably wary of me and not ready to experiment,” he recalls. In 2006, two residents of Albati village in Karauli, Ram Singh and Shripath Gurjar, broke the ice and helped Singh organise a meeting with farmers in their village. At the meeting, a few farmers described the history of pagaraa in the region. They talked of a legend, which describes people of the Lodh community practising farming on rocky land using this method 300 to 400 years ago. There are remains of pagaraas in the jungles surrounding the area. 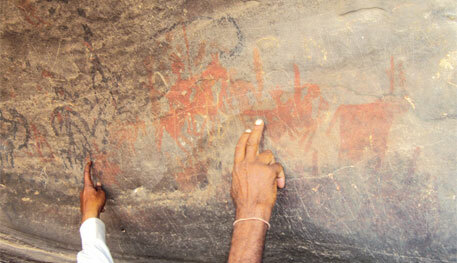 Such water harvesting structures can also be seen in the rock paintings in the region, which people say have never been documented. The farmers agreed to revive pagaraas but were still wary of turning the traditional structures into cemented ones. Among them was Halaku Patel of Albati village in Karauli. “We were suspicious when Gram Gaurav activists approached us. We were happy in our daily struggles of rearing animals and part-time farming, and feared losing whatever land we had,” says the 60-year-old, smoking hookah on a wooden bed under a tree. “We used to barter dairy products such as ghee for sorghum and pearl millet. I first tasted wheat when I was 25,” he says. “We used to go south-west to rear animals till the late 1980s. But by then, the prey base of wild animals had shrunk because of unabated deforestation. They started attacking our animals. The shepherds of the Marwar region also started bringing their sheep and goats. This led to overgrazing. We once had a bloody fight with them,” says Patel. All this led them to think of alternative livelihood. They turned to farming, but they would barely harvest a tonne of wheat from a hectare. 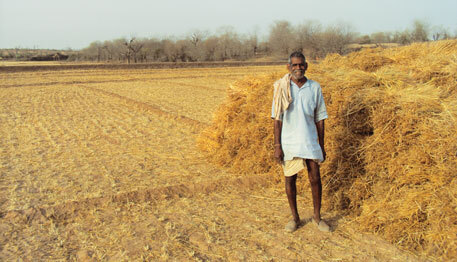 By 2006 Patel and other people in his village were finding it difficult to sustain. “Our cattle was not getting enough fodder and the barter system was virtually dead. After the meeting that year, I decided to take risk. I am happy I did so,” says a beaming Patel. Wheat production in his farm has tripled. Patel’s pagaraa was the third in the region. 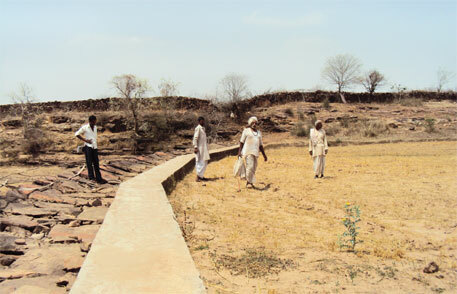 Fellow Albati residents, Ramji Lal and Ram Swaroop, constructed such water harvesting structures in 2007. Gram Gaurav has constructed more than 170 pagaraas in 365 villages in Karauli and adjoining districts. The non-profit has also built other water harvesting structures (see ‘An oasis for cattle’). As a result, the rocky area now has patches with thick layers of soil. “The land does not need regular irrigation. We irrigate it once a season and the moisture accumulated in the soil takes care of the rest,” says Patel. Gram Gaurav’s effort has led to more than 80 hectares of agricultural land in an area where once only acacia trees thrived. “Agricultural production has gone up three to four times,” says Radha Shyam, an activist of the non-profit. Gram Gaurav provides cement, skilled labourer, while the community supplies stones, chips, sand and labourers, whenever a pagaraa is erected. “These water warriors are like Lord Krishna. We were poor Sudama. I have only one complaint. Why did they come so late into our lives?” asks a grateful Patel. This is the real Jugaad innovation from rural India. Hopefully it will be replicated successfully in other places. Here in Telangana we have similar rocky terrain and uneven rainfall. We can benefit a lot from such systems and water retention and saving methods. Won't concrete structures lead to water logging? Stone bunds would let water through and retain the soil. Great story. Quite inspiring. Such rural geniuses should be identified and the Government should come forward to expand their development efforts. Only Scams ,corruption,murders,loot etc. appear prominently in press but not such inspiring stories. I am glad that Down To earth has been bringing to lime light such selfless efforts. Down To Earth has unique journalism. Three cheers to the Editor and contributors for their great service to the Nation.